The Healthy Moms Magazine invites you to join us for our first weekly Twitter Party / Chat on #ChildObesity on Monday January 14, 2013 from 9-10pm E/ 6-7pm Pacific. This week’s party is sponsored by TalbertNutrition.com. Every Monday night we will chat on Twitter about a topic related childhood obesity in the United States and share tips on how you can get involved to help reduce the statistics. This week our topic is, “You can make a difference.” Learn about simple steps that you can take to reduce your children‘s risk of obesity, heart disease and diabetes. You can also share your tips on what you are doing to help promote a healthier generation. We will also be giving away 3 thank you gifts full of healthy child friendly prizes from talbertnutrition.com just for participating. And one participant will receive the copy of the book, “Beat Sugar Addiction Now! for Kids,” by Jacob Teitelbaum, M.D and Deborah Kennedy, PHD. Follow our host, The Healthy Moms Magazine @cltalbert and our sponsor, talbertnutrition.com @talnutrition, and leave your twitter handle in order to be entered to win prizes. 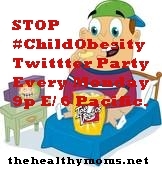 Then log into TweetGrid on Monday January 14 at 9-10pm E/ 6-7pm Pacific and use hashtag #ChildObesity. http://www.simply-linked.com/listwidget.aspx?l=a0445ff6-8941-408e-a0ef-bddc19b0b4a3 We hope to see you there! Interested in sponsoring an upcoming #ChildObesity Twitter party? Contact us for sponsorship opportunities. Related Does Your Child Suffer from Constipation?